Hungarian Prime Minister Viktor Orban delivers his annual state of the nation speech in Budapest, Hungary, Feb. 10, 2019. Orban, an outspoken nationalist, wants to remain in the EPP, Fidesz said on Tuesday, despite growing pressure within the European Parliament's biggest grouping to suspend or expel it, a scenario backed by European Commission chief Jean-Claude Juncker. "Viktor Orban must immediately and permanently end his government's anti-Brussels campaigns," Manfred Weber, the center-right European People's Party (EPP) candidate to be EU Commission President, told Bild newspaper. People protest after Hungarian Prime Minister Viktor Orban delivered his annual state of the nation address in Budapest, Hungary, Feb. 10, 2019. Juncker, who in 2014 was the EPP's candidate for the top EU executive position he now holds, accused Orban of coming "within a hair's breadth" of peddling falsehoods and said he would support the exclusion. Asked about Orban, Juncker told German broadcaster ZDF: "Whoever lies in European affairs for domestic political reasons has to ask himself whether he still wants to belong to the EPP club. I think, they are not one of them any more." 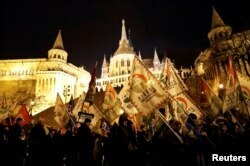 "I already said months ago that the EPP's biggest problem in the European elections has a name, and that is Orban. I will support this exclusion," Juncker added. Speaking to journalists in the Germany town of Rottersdorf, Weber said that in recent weeks "Viktor Orban and the Fidesz have crossed red lines again" and added that all options were on the table, "especially the option of expulsion and going away, going our future way without Fidesz." Orban's party said in a statement: "Fidesz does not want to leave the (European) People's Party, our goal is for anti-immigration forces to gain strength within the EPP." 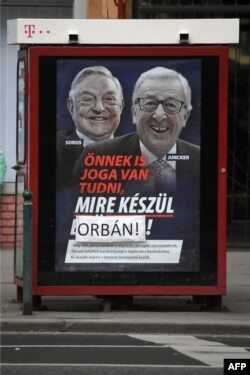 A poster on a telephone booth shows EC chief Jean-Claude Juncker, right, and Hungarian-born U.S. investor George Soros and a slogan reading "You too have a right to know what Brussels is preparing" as the name "Brussels" is covered by the family name of Hungarian Prime Minister Orban in Budapest on Feb. 26, 2019. "In the details, of course, we have differences of views, but far more important than these differing opinions is that this initiative be a good start to a serious and constructive dialogue on the future of Europe," Orban said in a statement to Reuters. Weber told Bild newspaper he expected an apology to EPP member parties, an immediate and permanent end to Orban's anti-EU campaigns and renewed government support for Central European University to stay in Budapest. CEU was forced out of Hungary and plans to relocate to Vienna from September as Orban wages a bitter campaign against its founder, U.S. billionaire George Soros, accusing him of supporting immigration to undermine Europe's way of life.